You can read Jared’s first post on this topic, where he joins the Wednesday dance club, here. The MSF project in Jahun has two approaches to deal with fistulas. The first, and where I am working, is an MSF partnership with the Nigerian Ministry of Health to run a maternity and neonatal unit. The unit offers hospital-based, free pregnancy care for all women in the area. If the women come to the hospital to give birth, obstructive labours, alongside all types of pregnancy issues, can be treated. Obstructive labours, where the baby gets stuck in the birth canal, are one of the primary causes of fistula, so giving this care will hopefully prevent fistulas in the first place. 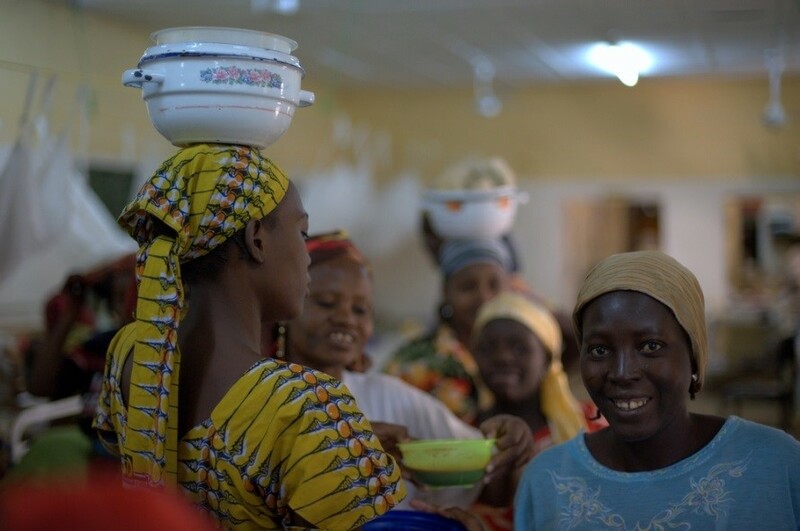 The ward is overall a happy place, with movie nights, nourishing food and dancing! Education and partnerships are also being developed with small surrounding birth centres so that their staff can recognise labour complications early and refer the patients easily and quickly to the Jahun Hospital. The second arm is dealing with the women who already have fistulas. Women can attend the VVF (vesicovaginal fistula) unit without cost and the care is comprehensive. Treatment isn't simply just about the surgery, but is multidisciplinary and aims to treat the whole person, not just the fistula. Dancing is just one of the many treatment approaches. As I explained in my last post, these women have terrible stories and psychological injuries, and are often very malnourished. So, prior to surgery, the women are seen by the counsellor for one-on-one sessions where they tell their story, and they then also participate in small group therapy sessions. The ward is overall a happy place—this is the aim of the amazing team that works there, with movie nights, nourishing food and dancing! All with the higher objective of trying to reinstall in these women their worth and value to society. Once they are healthy and medically suitable for surgery, they are given a prized date for theatre. In the weeks leading up to surgery, patients need encouragement to keep drinking six to eight litres of water each day. Photo: Penny Bradfield. A group of amazing VVF surgeons take turns coming to the unit every two weeks. They often operate for three days, performing these complicated surgeries which takes great skill. I had an opportunity to join one of the VVF surgeons, and the mood in the operating theatre was electrifying and contagious. I think this is from seeing the patients walk through the double doors into theatre with these huge smiles on their face. They know this is going to be a special day for them, and the next big step on their recovery journey. While patients will still have their catheter for a couple of weeks as they heal from the surgery, the day of the surgery should be the last day of leaking urine for them. No need for constant showering and changing clothes, and being worried about the smell or where they will sit. A reason to dance even more the next Wednesday! I often visit the VVF ward as a bit of a pick-me-up, and sometimes stay to watch the movies with the ladies. Often it ends with me buying all the jewellery they have been making. I think they think I have a lot of sisters as I have bought so much of it! Just can't say no to those smiles. There is a lot of sadness here in Jahun, but this is one place you see it disappearing in individuals. I've watched patients change from their arrival at the unit to becoming ready for surgery and hopefully I will see some of them discharged in my time while here. I am looking forward to 'shaking it' with the VVF ladies again next Wednesday afternoon. I'm sure I can provide them with a lot more laughing material with my dance moves. But I really hope one day soon there won't be any more dancing around the septic tank. Why you may ask? As there simply won't be the need, as fistulas and VVF patients will be a thing of the past for Nigeria and Africa.